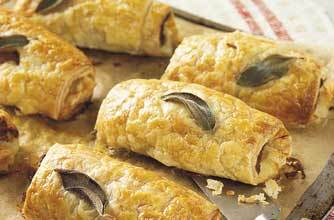 Crunch into this puffy sage embedded pastry with delicious sausage. It is great for parties, picnics, afternoon tea and any-time snack. Set the oven to 200°C or gas mark 6 and heat up a baking tray in it. Unroll the pastry on a lightly floured surface. Place 6 sage leaves on top of 1 sheet and lay the other pastry sheet over it, with 6 more sage leaves on top. Flour a rolling pin and roll out the pastry until it measures 30 x 20cm (12 x 8in). Cut the pastry in half lengthways, then cut each strip into 3 pieces. Spread 1tsp mustard on to each one. Place a sausage in the middle of each piece of pastry. Brush beaten egg along the long edges of pastry, then wrap it around the sausages and put, join down, on the lined baking sheet. Put this baking sheet on top of the hot one in the oven. Bake the rolls for 35 mins, until the pastry is golden brown and the sausages are cooked through. Serve warm or cold.